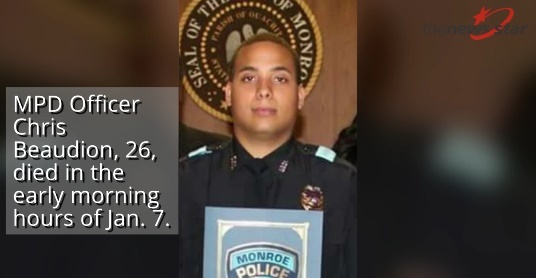 The Monroe, LA, officer who died on duty early Sunday morning apparently shot himself before crashing his patrol car. Officials in each of the agencies investigating the incident confirmed the shooting for The News-Star, but declined to be identified. Officer Chris Beaudion, 26, was pronounced dead on the scene following the wreck off of Winnsboro Road. His patrol car struck a tree. It's unclear whether Beaudion shot himself accidentally while driving or committed suicide. A memorial fund has been established on behalf of the officer's family. Beaudion was married with children.